Peanut Butter Cup Brownies have a cookie layer and a brownie layer~with Reese’s peanut butter cups sandwiched in between! These peanut butter cup brownies can be whipped up in 30 minutes, thanks to super convenient cookie and brownie mixes. These are so easy and yummy, that I try to keep a few mixes on hand so that I can whip these up when I need an easy dessert. Publix often runs the mixes and the candy on sale BOGO, so I try to stock up then. 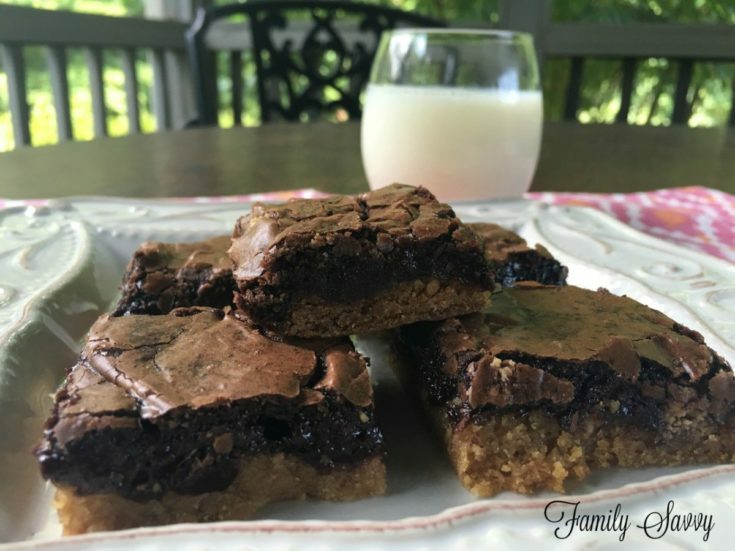 These layered brownies are VERY rich! Adapted from this Betty Crocker recipe, the original version is even more over the top. It calls for peanut butter sandwich cookies (i.e. Nutter Butter) in the middle along with the Reese’s. I omitted those and these were perfectly rich and decadent without them. The Betty Crocker version also includes an optional peanut butter drizzle, which just uses peanut butter and coconut oil. I haven’t tried the drizzle on these yet but think it would make these richer without added sweetness. Mixes: For the peanut butter cookie mix, I prefer Krusteaz, but Betty Crocker is also good. My favorite brownie mix is Ghirardhelli Chocolate Supreme~the one with the pouch of chocolate syrup. This is the best store bought brand (according to Cook’s Illustrated taste tests). Make ahead: These can be made ahead and frozen for several weeks. The easiest way to freeze these is to remove the entire pan of brownie onto parchment to cool. Wrap the entire pan (don’t cut) in parchment and a freezer bag. When ready to serve, thaw on the counter and cut into perfect squares when still partially frozen. Cutting is much easier when they are still slightly frozen. If you try these, please let me hear back from you with your thoughts and opinions! As always, thanks so much for stopping by. Be blessed, and stay savvy!!! Line a 13 x 9" pan with parchment paper (leaving 2' overhang); spray with cooking spray. In medium bowl, make cookie dough per directions on package. In another medium bowl, make brownie dough per directions on package. Crumble cookie dough on bottom of pan; spread evenly with spatula to cover pan. Place Reese's cups on top of cookie dough, spacing evenly. Spread brownie batter over cookie dough and peanut butter cups, covering completely. Bake 30 minutes or until toothpick inserted into center comes out with few crumbs. Cool completely in pan before gently removing with sides of parchment paper. Mix peanut butter and coconut oil on high in microwave at 30 second intervals. When smooth, drizzle over bars.